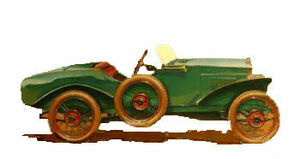 The IENA (Industria Economica Nazionale Automobili ) was an Italian automobile manufacture based in di Tommasi et Rizzi in Lodi from 1921 until 1925. Two versions were made, a 750 cc light car and a 1096 cc sports car, it used a French four-cylinder Chapuis-Dornier engine and later an OHV unit was used in the Tipo Spinto Sport model. About 150 total cars were made.